When I went to the Seychelles, I expected to be surrounded by couples gazing adoringly into each other's eyes. I predicted that the only other people there would be part of a pair, and that I would spend the majority of my time rolling my eyes at their displays of affection. In reality, I saw a lot of couples who had been in the company of only each other for a fortnight. And boy, could you tell. They had that glazed-over expression that comes from spending every single minute with the same person. A few had the look of terror that can only come from the realisation that this is what they would feel like FOR THE REST OF THEIR LIVES. I may be exaggerating. But even if I am, and even if they were actually just held in rapt, content silence, you still need some activities. Some distractions. Just something. So here are a few suggestions. The good thing about this option is that you can choose between going it alone, or dragging your partner with you. You won't, however, have to talk to them, or even look at them, while you're in the boat. But you'll still be technically doing a couple's activity. If you've just realised that you cannot listen to your new spouse speak for even just a second, then snorkelling is for you. All you'll be able to hear is the sound of your own breathing. As you'd expect, the waters are clear as crystal, and you'll spot most of the cast of Finding Nemo. Watch out for the coral, though - when I was snorkelling, I scraped the front of my thighs when I became beached on the stuff, like an ungainly whale. Then I got a bit concerned that the blood spurting out of me would attract a shark, so I got out of there and left the others to deal with the repercussions. Then a good looking man put some anti-septic on me so yes, I think I did OK. Even if you're staying at the one resort for your whole trip, you can easily make a day out of visiting another island. Boats go regularly (though at very early hours) and you can spend the day discovering another way of life. My favourite island by far was La Digue - there are no cars, just bicycles, and the whole place has a laid-back, old world vibe. Cycle out to Anse Source d'Argent, which regularly makes the list for World's Best Beach. You'll need to be on Mahé for this one to work. In the middle of the capital, Victoria, you'll find a sprawling, steamy market where you can browse the vegetable and fish stalls, or pick up some gifts for home. My advice is to stock up on spices, then sit at the top balcony with a cold drink and watch the people come and go. Take my word for it - you won't be the only silent couple here. Vallee-de-Mai Nature Reserve is on Praslin island, and it's where you'll find the Coco de Mer, the nut you'll see all over the Seychelles. It's also a good test for your compatibility as a couple. If one of you sniggers at the sight of what looks like a lady's bottom and the other does not? Then I'm sorry. I can't help you. 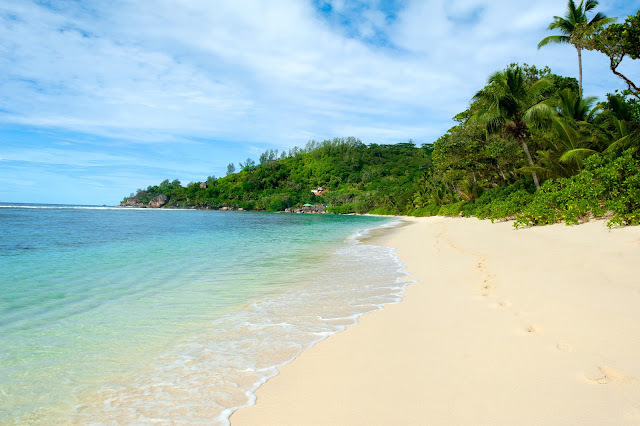 Read my article about the Seychelles on the Irish Independent.